Oscars knew they were taking a risk when they announced that 4 longstanding categories will be nixed from the upcoming broadcast, instead being presented during the commercial breaks. Now some legendary Oscar-winning directors are coming out against this move. And they're pretty mad about it. The Academy Awards is not having the best year thus far. They couldn't find a host in time after Kevin Hart bailed out due too much controversy surrounding past comments that were deemed anti-gay. They wanted to make the show more appealing to a younger audience, but that backfired, and now they want to make the show shorter, which will happen when they cut four under the line categories from the broadcast. This latest move is causing even more of an uproar as some big names are against it, and think it's wrong. The four categories that won't be getting any love during the actual show are Best Cinematography, Best Editing, Best Live Action Short, and Best Makeup and Hairstyling. However, these awards will be presented during the live stream, so fans who want to watch can see it happen there. And the awards winners will be announced later in the show. 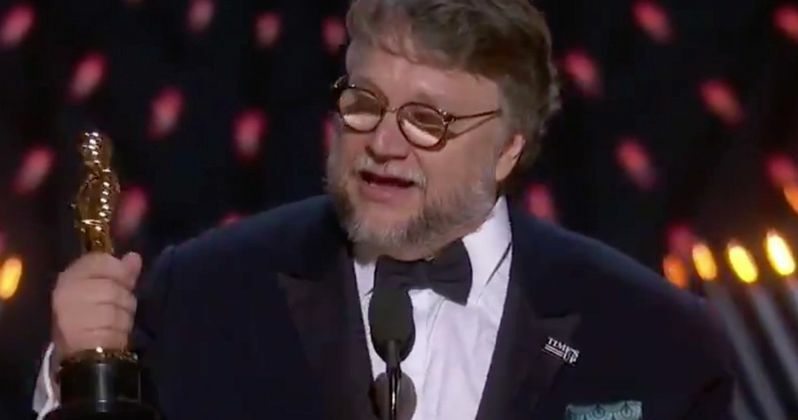 Guillermo del Toro was one of the first to come out against this burying of award categories. And he's taken the most umbrage with the exclusion of the Editing and Cinematography categories. The Best Director and Best Picture winner (for last year's The Shape of Water) said this in a tweet that has since been deleted. "If I may: I would not presume to suggest what categories to cut during the Oscars show but - Cinematography and Editing are at the very heart of our craft. They are not inherited from a theatrical tradition or a literary tradition: they are cinema itself." The decision to cut the four categories was announced last summer, and there wasn't much said about it at the time. Though it wasn't known until earlier this week which categories were going in the dumpster. The Academy wanted to launch a new category this year for Best Popular Film, but that was a very unpopular idea right out of the gate, and it was quickly silenced following much outrage, especially by fans who didn't want to see Black Panther get a Popular Oscar instead of a Best Picture nod. A number of big name directors also cried out into the night about these four categories getting the axe on live TV. Oscar nominee Alfonso Cuarón first re-tweeted a fan who went to him directly asking, "Please make your powerful voice heard. We're with you. To ignore those categories is disrespectful to filmmakers efforts and creativity. Without Editing and Cinematography we have no movie and no actors, period. They are the backbone of the industry!" Cuaron later tweeted the following. Alfonso Cuaron could make history this year, with the first ever Netflix nominated movie Roma. The film is up for 10 awards. And it is considered the frontrunner for Best Picture and Best Director. He is also expected to win the Best Cinematography Oscar, so he has a horse directly in this race. If he wins, those at home won't see it. This would be the first time a director has ever won the category for shooting his own movie. The Academy claims they will cut the acceptance speeches back into the show, edited and timed for shorter consumption, but it's not exactly clear how this will work just yet. It's also confusing in that sometimes these speeches run over. And commercial breaks are a specific allotted amount of time. So will the show find itself cutting back into acceptance speeches? That is another thing currently being considered. Others are also speaking out. They include Star Wars: The Last Jedi cinematographer Steve Yedlin, A Quiet Place screenwriters Bryan Woods and Scott Beck, and legendary cinematographer Emmanuel Lubezki, who is a 3-time Oscar winner for Gravity, Birdman and The Revenant. He calls this move an 'unfortunate decision', saying "cinematography and editing are probably the 'elementary particles,' the primordial components of cinema." Others have mirrored this sentiment including cinematographer and director Reed Morano. The Academy still has time to change their mind. And it will be interesting to see how this entire show plays out. The Oscars haven't gone without a host since 1989, and that is considered one of the most disastrous telecasts in the history of the show. The 91st Academy Awards will air in two weeks, on Sunday, February 24 on ABC. It will also be streamed live without commercial breaks to everyone around the globe.